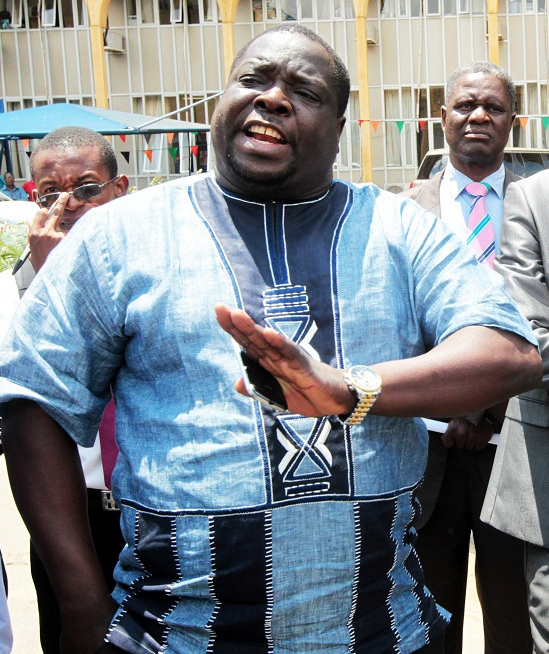 Information and Broadcasting Services Minister Chishimba Kambwili who is also Chief Government Spokesperson has disclosed that the 650 Health Posts which were promised by the late President Sata will become a reality by March 2016. Mr. Kambwili disclosed this when he paid a courtesy call on Senior Chief Mwata Kazembe of the Lunda people of Luapula Province in Mwansabombwe. The Chief Government Spokesperson said Government is concerned at the slow pace at which the project was being carried out and President Lungu called a meeting at State House with all the Contractors to remind them on the need to speed up the works and gave them a time frame within which the works must be completed. Mr. Kambwili said the discussions between the Indian Government and the Zambian Government started when he was Foreign Affairs Minister when India offered 50 million Dollars and President Sata said the funds must help Zambia to build Health Posts for the people. The Minister said it was President Sata’s vision during his campaign messages to the people of Zambia that there should be a health facility within every 5 square kilometers which President Lungu has also adopted passionately and remains committed to its realization for the people of Zambia. Mr. Kambwili explained that the pre-fabricated materials to be used for the health Posts from India were already in Zambia and will just be assembled in the selected sites dotted countrywide. He is optimistic that once the Health Posts are in place, it will be a relief to the people because they will be accessing medical care within reasonable distances. And Mwata Kazembe said the promise of the Health Posts have been on the lips of the people for a while and the momentum died down a bit but the desire to see them become a reality has not withered because people need to access medical care within reasonable distances. Its your children who will pay for this loan with interest for mere health posts…surely 50 years after independent you can not even build a simple health post in Katete. Ba Kambwili dont forget that your boss want some praise even if the project was for sata now you are praising sata forgetting that mr lungu is now running the projects. Atase iwe! this is an insult to Obama. These PFools continue to be guided by a rotting corpse. Effects of no vision. WE NEED PICTURES TO SEE THE ONES WHICH HAVE FINISHED ALREADY. IF I AM LIVING ABROAD, WHERE CAN I SEE THESE HEALTH CENTRES WHICH HAVE ALREADY FINISHED AND THOSE UNDER CONSTRUCTION? SOMETIMES WE NEED PICTURES FOR RESEARCH AND OTHER THING AND OUR NEWSPAPERS AREN’T THE BEST PLACE WHERE TO FIND THEM. I AM DOING A RESEARCH TO JUSTIFY MY BUSINESS PLANS- PLEASE, WHERE CAN I FIND SOME OF THESE PICTURES. NOT THE ONES IN LUSAKA AND CB. BUT, THE ONES IN TYPICAL ZAMBIAN RURAL AREAS. HELP, ANYONE. THANKS. These are merely prefab units made in India equipped with Indian equipment and assembled on the ground by Indian engineers that is what you get when you obtain a loan via an Exim Bank!! In all honesty there is nothing to sing about here if anything this BUFFOON should think Zambians are a truly ignorant and uninformed people….these selfsame health posts are being constructed via a credit loan facility from Exim Bank of India and to add salt to the injury the construction is wholly been done by three major Indian construction contractors using possibly prefab units specially imported from India and assembled here in Zambia….win for Indian jobs win for Indian manufacturing who are supply all health equipment and apparatus .. All we have to do as usual is pay up the kaloba when its due. Sata will not pay for these loans…its our children…how embarrassing it will be when they ask why we couldn’t build four walls and equip them. Zambians wake up from your folly! SO, INDIRECTLY, INDIA SOLD ZAMBIA RUBBISH AND NOT THAT ZAMBIA GOT A LOAN FROM INDIA. WHY DO WE NEED PRE-FABS WHEN THERE IS A LOT OF CEMENT IN ZAMBIA?